That’s a radical first sentence. How in the world does one “lead” a shift in the fields of collective awareness and intention? I’m not exactly sure about the how, but I am certain that any such shift is the sort of event that not only demands leadership, but also comes to define it. Certainly we can expect that anyone who is called to authentic leadership is also called to actually stand in that new place of awareness and intention. I read “ego-awareness” not in reference to the state of the leader but as the dominant field of awareness of our day and of the last five centuries. I read it as referring to a Cartesian state of separation that has justified our mechanistic efforts to dominate and exploit the planet and one another. When I read eco-system awareness, I feel invited to see the whole as part of the whole. I am invited into a form of leadership that senses, sees and decides from a true understanding of the interconnectedness of all things. Here “eco” is not strictly referring to the natural world, but to the interdependence of living systems. 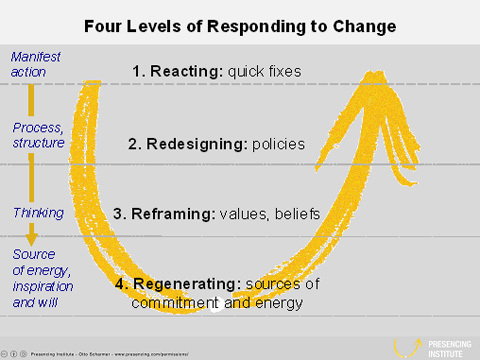 The true departure away from dominant approaches to leadership happens when Scharmer proposes that how we attend to a situation is what affects what emerges. I read a break from a linear approach that can be reduced to logic models, but even more importantly, I hear a confirmation of the idea that how we get there is as important as getting there. This first proposition challenges the very way in which we pay attention, it poses a mighty demand on our own development and it calls forth a form of leadership that is significantly different from the models that we are used to. As always, I continue to ask the question – what does this all mean to those of us engaged in the work of social transformation? Is there enough truth here for us to become more free?